The GRAS RA0401 is a high resolution version of the well-known standardized 60318-4 ear simulator, which has gained wide acceptance as the preferred tool for measurements with simulation of the acoustic load presented by the human ear. The RA0401 embodies a number of carefully designed volumes connected via well-defined and precisely tuned resistive grooves. In an equivalent electrical circuit, capacitors would represent the volumes, and inductance and resistance would represent respectively air mass and air flow within the resistive groves. The advantages of the design with resonance dampening are clearly visible when comparing the standardized RA0045 Ear Simulator and the RA0401 Ear Simulator. It can readily be seen that the amplitude and shape of the half-wave resonance are very different. Where the standardized ear simulator has a peak that tops above 36 dB, the RA0401 is 14 dB lower. At the same time the slopes of this resonance are more rounded in the RA0401. The overall result is a much more useful response, whose effects on measurements are much easier to identify. The RA0401 is for measurements on earphones and hearing aids coupled to the human ear by ear inserts such as tubes, ear molds, or ear tips and for measurements where the influence of the pinna and the head and torso are part of the investigation. For upgrade information, contact GRAS. 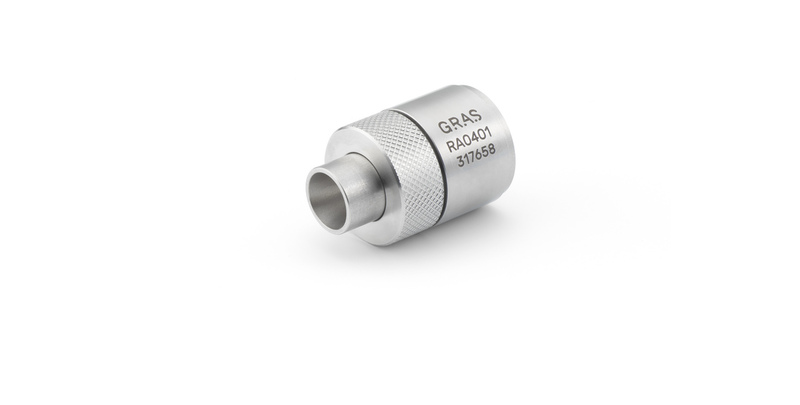 With the RA0401 coupler, it is now possible to measure below and above 10 kHz in the same measurement setup, at the drum reference point and with the same acoustical loading of the transducer under test. This makes tests of headphones much easier, with improved repeatability. RA0401 can be used as a development tool for development of insert type headphones as well as supra- and circumaural types. For R&D of headphones, the RA0401 can be mounted in a KEMAR. When furnished with the anthropometric pinna, tests of supra aural and circum-aural headphones can be done to a much higher degree of realism than previously possible. When a headphone is mounted, the anthropometric pinna collapses against the head much like the real ear, and sealing and leakage related effects can better be investigated. For insert type of headphones the better shape of the ear canal improve seal and fit, vastly improving repeatability of measurements. The combined advantage of the anthropometric pinna and the RA0401 is better test results at low frequencies and improved resolution at high frequencies and much improved repeatability. For QC purposes, the RA0401 can be mounted in a 45CA Headphone/Hearing-protector Test Fixture. The RA0401 can be used with a standard LEMO preamplifier, e.g. the GRAS 26AK 1/2" Preamplifier or the GRAS 26AC-1 1/4" Preamplifier fitted with an adapter. For the 1/4" preamplifier, use either the straight RA0003 Adapter or the right-angled RA0001 Adapter. Like the RA0045 the RA0401 has a dust protection filter to prevent dust and dirt from entering the internal volume. This filter should be kept clean and replaced when needed as dust build-up will influence the performance of the ear simulator.